Marta is a characteristic village of the Tuscia area, northern Lazio, on the southern shore of lake Bolsena, the largest volcanic lake in Europe, at about 20 km from Viterbo, the provincial capital. The little village is located at the foot of mount Marta, where the church of Madonna del Monte is situated. From here one’s gaze slides over the roofs of the buildings to plunge into the blue water of the lake surrounded by the Volsini mountain. Liying betwen the lake shore and farmland, Marta offers visitors an enchanting experience. Of medieval origin, it’s perfectly preserved and to take a dip into in the past and savour enchanting views. 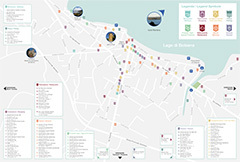 Arches, niches and little squares connect the narrow streets and stairways which from the clock tower wind down to the shores of lake Bolsena and the characteristic Borgo dei pescatori (fishermen’s village). According to legend, the clock tower was built from the remains of ancient Bisenzio. From there you can admire a striking 360 ° panorama of Lake Bolsena. Just outside the town centre, towards Capodimonte, is the little church of the Madonna del Castagno with its flowery garden. To the south, on the way to Tuscania, is the Cannara, a splendid botanical garden with an ancient eel-trap built on the river Marta. On a hill facing the clock tower is the Romanesque church of the Madonna del Monte, to which all Marta inhabitants are devoted. Every year on May 14 there is the very special festival of the Madonna del Monte, also known as the Festa delle Passate or the Barabbata, which attracts hundreds of tourists. Walking along the splendid lakeside promenade towards the romantic promontory known as Pontone, the visitor encounters the enchanting Villaggio dei Pescatori (fishermen’s village) with its characteristic fishing boats pulled ashore. Marta is also nature and relaxation. To enjoy the clear lake waters, you can choose between different little beaches where you can experience moments of tranquillity immersed in the green of the hills and the blue of the waters. The landscape-environmental context in which Marta is immersed, is a precious heritage, protected by national and international regulations to protect the delicate ecosystems. It is a perfect destination for hikers and nature lovers. The lake fish are plentiful in the lake and some are also famous, like the eels mentioned by Dante, in the Purgatorio. Several species of waterfowl live theren permanently or stop during migration, attracted by the untouched nature and the abundance of fish and other small prey. The islands, the Bisentina and the Martana, preserve a vast botanical heritage and have a high historical value becouse they were holiday residences for the various lords who dominated these lands. The volcanic nature of this territory has an excellent soil fertility and allowed the development of a quality agriculture that has rewarded many basic products of the renowned Mediterranean diet. An excellent product of the area is Cannaiola, unique to Marta, a ruby red wine with a sweet and full-bodied flavor with an intense fruity aroma which obtained the D.O.C from the E.U in 1996. Marta is in a strategic position that allows you to reach other places in a short time. There are many pleasant walks in the area. Nature and the climate are an irresistible invitation for those who love hiking, horse-riding or cycling, while the unspoilt beaches and the fishing port offer endless opportunities for recreation and entertainment. Throughout the year, but especially from May, ancient sacred festivals and gastronomic events enliven the days and allow visitors to immerse them selves in the soul of the country.